Lisa Copen has started a list called, "30 Things About My Invisible Illness You May Not Know." She and her bloggy friends are filling it out and posting it on their blogs and facebook as a way to raise awareness of invisible illnesses and to spread the word about Invisible Illness Week coming up soon. 1. The illness I live with is: Dysautonomia, a dysfunction of the autonomic nervous system. Specifically I have been diagnosed with POTS and NCS, both of which are types of dysautonomia. I also have Gastroparesis, Joint Hypermobility Syndrome (formerly called Ehlers-Danlos Type III), Chronic Fatigue Syndrome, a few different sleep disorders, and possibly a Mitochondrial Disease. 2. I was diagnosed with it in the year: Diagnoses came starting in 1992. The most recent diagnosis came in 2007. 3. But I had symptoms since: around 1990. 4. The biggest adjustment I’ve had to make is: It’s impossible to just pick one big adjustment. There have been so many adjustments over the years. Most of them are hard at the time. - realizing that dreams and plans I had for the future aren't going to happen, or will happen very differently than I had thought! - getting used to my illness being "seen" when I go out in a wheelchair. - learning to just lie down when I need to whether I'm in church, Wal-Mart, at a wedding, a restaurant, or wherever. - learning to let Will help me with basic things like getting food, getting dressed, and showering. - admitting that I need help from others. 5. Most people assume: that when I’m smiling and sitting in my wheelchair or walking a short distance that I’m doing well physically. In reality, it is hard for me to sit in my wheelchair. It makes me very tired. Walking is tiring, too. It is never easy. 6. The hardest part about mornings are: moving, getting up, getting dressed, and getting my brain functioning and thinking clearly. My body is so slow in the morning. It just doesn’t want to work! 7. My favorite medical TV show is: I don’t watch any medical tv shows. I live the reality of it. When I watch tv it is nice to escape that world for a while! 8. A gadget I couldn’t live without is: Well, technically I could live without any of them, but I especially appreciate my shower stool, my wheelchair, and my walker. They make showering and getting out of the house possible. I also especially appreciate the computer and internet. It is my connection to the outside world and my many friends with dysautonomia. 9. The hardest part about nights are: not being able to fall asleep, waking up often in the night (due to sleep disorders, pain, and temperature regulation issues), never getting enough sleep. 10. Each day I take at least 7 different pills & vitamins. 11. Regarding alternative treatments I: have tried many. Some because I wanted to, others because I felt pressured to. In general, alternative treatments don’t work for someone like me who has dysautonomia. You cannot fix a broken autonomic nervous system. Peppermint tea can ease nausea. A healthy diet is beneficial in a small way. But nothing actually fixes the root problem. Most alternative treatments do nothing, or make things worse. Only God can fix a broken autonomic nervous system. 12. If I had to choose between an invisible illness or visible I would choose: I’d just leave this one up to God. Both are hard, just in different ways. 13. Regarding working and career: I don’t mind that I’m missing out on a career. I love being a stay-at-home mom. I just wish I had the strength and energy to do all the “mom stuff” I’d like to do. 14. People would be surprised to know: how lonely it is living with a chronic illness. 15. The hardest thing to accept about my new reality has been: being left out of activities because I either physically can’t do them or because people don’t think to invite me. 16. Something I never thought I could do with my illness that I did was: have a child. 17. The commercials about my illness: don’t exist. There are hundreds of thousands of people with dysautonomia, but we are all but completely ignored by the media. 18. Something I really miss doing since I was diagnosed is: walking by Will’s side and holding his hand. 19. It was really hard to have to give up: my independence. 20. A new hobby I have taken up since my diagnosis is: crocheting and knitting. 21. If I could have one day of feeling normal again I would: go hiking and camping in Alaska with my family. 22. My illness has taught me: how very, very blessed I am. 23. Want to know a secret? One thing people say that really bothers me is: When someone who is healthy complains about being tired or complains about sickness that lasts only a couple of weeks. 24. But I love it when people: say that my life encourages and inspires them. 25. My favorite motto, scripture, quote that gets me through tough times is: "For we know that our light and momentary troubles are achieving for us an eternal glory that far outweighs them all" (2 Corinthians 4:17, NIV). 26. When someone is diagnosed I’d like to tell them: that life with a chronic illness is hard, but that it can still be fun. There is real hope, and there is real joy in the midst of trials. That hope and joy is found only in the Lord Jesus Christ. 27. Something that has surprised me about living with an illness is: how very hard it is even when it looks easy from an outsider’s perspective. 28. The nicest thing someone did for me when I wasn’t feeling well was: offered help on a regular basis, but even more special - offered genuine friendship as well. 29. I’m involved with Invisible Illness Week because: there is so much that people don’t know about invisible illnesses. 30. The fact that you read this list makes me feel: like you care. Thanks for sharing! I really appreciate it! With Jada having diabetes, sometimes I feel like it's "invisible" sometimes it's not! I really get some of the things on your list. I think the one that struck a chord is those who complain about having a minor illness for a few days or a cold that hangs on for a while. It really bothers me when someone makes a big deal about their kids getting a yearly vaccination and how they just can't handle seeing their kids get shots---little do they know that Jada takes three shots a day plus 10-12 finger pokes in order to stay alive. ugh.. I'm so glad that you have your blog-- you're a tremendous encouragement to me and many others! 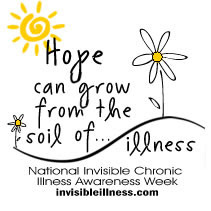 Praying that Invisible Illness Week receives some much deserved attention! Thanks so much for filling this out because it makes me feel like I know you so much better! I can really appreciate what you go through on a daily basis too. You are in my thoughts and prayers. Just stopping by from SITS to say HI! What a beautiful post. Ms. Copen is doing a great thing! Reading your blog today has been a true inspiration to me.....Praise God for the things we have and Praise Him for the things we've learned and the ways we've grown because of the things we don't. So, I am going to wait to read it I think! I'm so glad you filled it out and I'll be back to read it after I do my list! I did see the part about loneliness...oh my...feeling lonely is one of my biggest struggles. thanks for being so candid and open by sharing yourself with us... im looking forward to thursday and sat. night! Wow. I had no idea about all of this. Thank you for opening up. It's proof that not everyone who is suffering lets the world know about it. Some of the strongest people I've known put on a brave face and just deal with it as best they can. For that, you get a big (((HUG))). NOW, I can leave a comment about READING your 30 things! It was interesting to read your list b/c we have different things we picked but also soooo many similar feelings. I'm glad that I wrote my list before reading yours b/c then I got little chill bumps when I saw some of the things we wrote that were similar, esp. loneliness. Thank you for getting the ball rolling on this list and inspiring me to do it too! You know what's amazing? I'm stopping by from SITS and don't know you at all, but after reading this post, I don't sense sadness or grief, but rather joy! Praise God! Thanks so much for stopping by my blog and for leaving such sweet comments. I truly appreciate it. I read your awesome article on the II Awareness Website. I'm really glad you were able to submit one. I have been working on one but I have not been able to complete it because I have not felt well. I hope to get it in by the deadline. I've also registered to interview Lisa Copen. I just read your interview with her and it was really fabulous! I hope all of these things will help to bring more awareness to our illness. Well, I hope you have a great Labor Day weekend. You're awesome Rachel! I always enjoy your blog, and thanks for the information. Thank you for sharing this. I really have no idea about these autoimmune issues. It's nice to get a peak inside someone that's living it. I found you through my friend Dolly's blog, "SoulStops". I am so grateful I did. I have been writing a 31 days series on "Forgetting Myself" -- all because I just don't do a very good job of it. And as I have explored your blog a bit this evening, I am just so humbled by your beauty. Your heart, your faith, your strength is stunning. I am so happy to have found you here. I so look forward to reading more. Thank you.